Following three sold out tours over the last year and a half, Joe is mounting one more “encore” to the Fast Forward Tour. The band will once again feature Graham Maby on bass, guitarist Teddy Kumpel (Rickie Lee Jones, Feist), and drummer Doug Yowell (Suzanne Vega, Ari Hest). The summer tour will find Joe visiting several cities he hasn’t played in many years and, in some cases, cities where he’s never played. As before, the set list will feature songs from across the entire catalogue including a mix of old songs going right back to the beginning, as well as songs from 2015’s Fast Forward, and an unpredictable selection of covers. The band will be rehearsing and adding some songs to the repertoire just for this run. 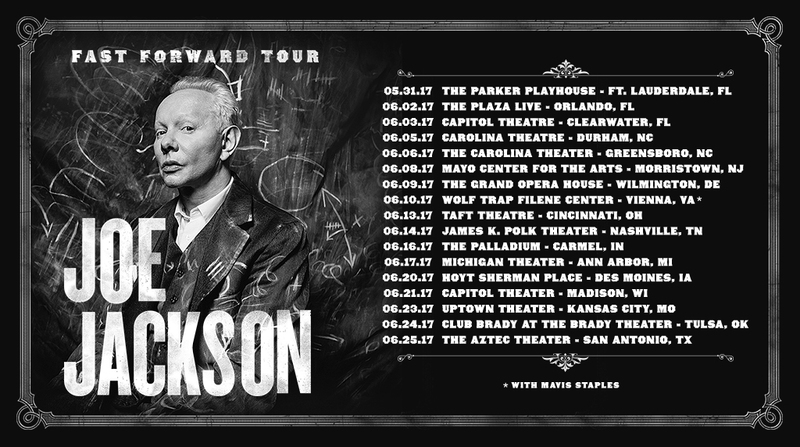 Visit http://joejackson.com/tour for the full list of dates.